Natural light streams through a floor-to-ceiling window in the corner of the studio space, nestled next to neatly-stacked shelves full of yoga mats and blocks. On rainy days, the gentle rooftop patter of precipitation makes practice all the more calming and meditative. This is Heartfelt Yoga Studio, and new owner Alice Gantman’s passion for it is palpable. Though opening a business was an eventual goal, Gantman hadn’t expected it to happen so quickly; The Ohio State University alumna earned her Bachelor of Science degree in Nutrition Science this past May, making her switch from undergrad to business owner exceedingly quick. Formerly Thank Yoga, the studio tucked snuggly between The Table and Fireball Press has a devout and established community, including Gantman, who built a regular practice there. When she heard that former owner Melissa Petty planned to close it in May, Gantman approached her with the goal of keeping that community alive. “The transition was really smooth because we did it for the people that are already coming here, the people that have also made this space their home,” she said. Though initially miserable, Gantman quickly began enjoying her practice after switching to a new instructor and community. She feels this is key to a good practice, and in addition to maintaining Thank Yoga’s existing community, Gantman hopes it will grow with Heartfelt by ensuring that everyone feels safe in their environment and practice. “It’s really important to me to create a space that people can feel comfortable in and be themselves, and not worry about what’s going on in their life, what they look like, and what they do,” she said. 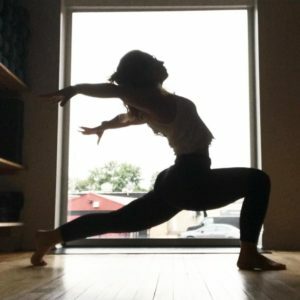 To that end, most of the classes offered at Heartfelt are centered around the popular Vinyasa style, which Gantman prefers because it allows students to practice within the structure offered by the teacher. The studio is also stocked with everything needed for practice, so whether you are a new student without a mat or just forgot yours at home, Heartfelt provides equipment free of charge. Heartfelt Yoga Studio, located at 29 E. 5th Ave, Ste 103, offers new student deals – steals, really – through their $25 two-week unlimited class pass or $40 one-month unlimited class pass. The studio also offers $5 drop in classes on Tuesdays and Thursdays at 5:00pm. In addition to a regular studio schedule, Gantman is also planning events like Wine About It, which entails 30 minutes of anything that helps you unwind (think journaling, coloring, chatting, and/or venting), followed by 30 minutes guided meditation, plus free wine for those of legal age. Keep an eye out for stand-up paddle board yoga at Hoover Reservoir, brewery yoga, and in-studio celebrity-led classes by Insta-famous yogis GypsyOn and Christian Florez. For more information, visit https://www.yogaheartfeltstudio.com/.